There’s a popular saying: “As California goes, so goes the nation.” Nowhere is that more true than in design where Cali tends to signal what’s in store for future trends across the country. Jackson Design & Remodeling is based in San Diego, and as a large, higher-end remodeler we have a lot of touchpoints in the design community. That puts us in a unique position to spot upcoming trends. To that end, I recently sat down with Tatiana Machado-Rosas, who heads up our design department. She had some great insights and trend predictions for 2019. Here are four standouts. People are gravitating toward the glam look, and we’re seeing it especially in tile, plumbing fixtures, lighting, and wallpaper. The overall effect is still simple—nothing is overdone—but you might have a wall sconce with crystal and metal accents, or a vanity with a glossy finish. That said, we believe that the art deco influence is ultimately going to be temporary, whereas a movement like mid-century modern (MCM) is timeless. The MCM look has been so successfully updated that it’s now part of everyday life. There’s a sense that it’s not even a mid- century aesthetic anymore, but the clean, contemporary look of today. Art deco on the other hand, could be hot in 2019, maybe 2020, and then will be gone ... until it comes back again for another round. Over the past couple of years, I’ve seen black being used more—specifically matte black—and I expect that trend to continue, especially as an accent. In California people tend to go lighter with their colors, and we’ve noticed a lot of kitchens and bathrooms that are punching up a white space by adding black for contrast, whether it’s faucets, appliances, or lighting. Alongside that trend, we’re seeing another one toward color. Homeowners are becoming more daring about making a bold statement, and thinking to themselves, “Nothing is going to happen to me if I add an orange or teal wall.” People are seeing it as a statement about who they are as an individual. Color is all over the kitchen now, whether it’s tile, wallpaper, cabinetry, and kitchen islands. We’re also seeing all sorts of colors in appliances, especially orange, yellow, and teal. 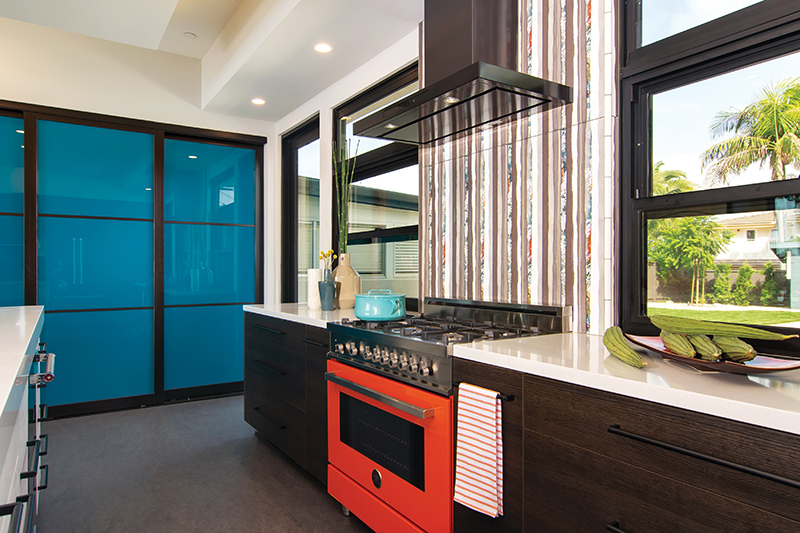 The colorful kitchens of today are truly new and not reminiscent of any time period at all. Instead of a retro feel, are either bold and bright, or darker, rich, and moody. Expect more cabinetry with an ocean- or slate-inspired hue. These saturated colors can give a room a surprisingly calming atmosphere. Whether it’s the material itself or how the ceiling is used to define space in the room, we’re seeing a lot of shiplap, metal, patterned ceilings, and architectural beams. This has also meant that flooring is becoming more neutral. Indoor/outdoor space is implemented all the time in California. But in areas with less wonderful weather, there’s a need for feeling close to nature, whether that’s wallpaper or something organic. Technology is taking over so much of our lives, we have a desire to get back to nature again. A recent bathroom we did has a tree stump stool in the shower. We also remodeled a master bath where we positioned the shower in the corner of the house with floor-to-ceiling windows. People are drawn to it, to the feeling that we need to go back to a sanctuary. I see that trend growing especially with younger people. It goes hand in hand with the farm-to-table concept that we see on social media regularly—vegetables fruits, meats that are sourced correctly, etc. This is a visual representation of that ideal: Your mind and body are connected to the place where you live. Todd Jackson is president of Jackson Design & Remodeling in San Diego. Loved your article regarding 4 design trends. I would love to see you share your thoughts on lighting too.